Hibiscus Films. 1990. Director: Jane Campion. 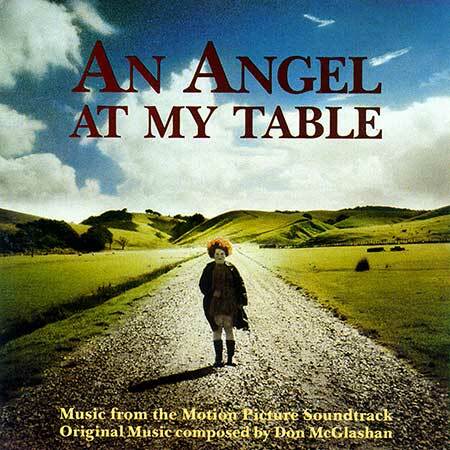 Music: Don McGlashan. Made as a three-part television mini-series, but also released theatrically in some countries. CD (ST) ABC. 846 954-2. 1990. Somebody Stole My Gal. (2:35). (Wood). (Control). v: Pat McMinn, Crombie Murdoch & the Nickelodeons. 12 Dancing Princesses. (1:28). (McGlashan). (Mana Music). Don McGlashan. An Die Musik. (3:05). (Schubert). (Control). v: Kathleen Ferrier. Janet’s Arrival At Seacliff. (1:55). (McGlashan). (Mana Music). Don McGlashan & Scott Terzaghi. Piano Sonata in Bb - Slow Movement. (9:18). (Schubert). (Control). David Guerin. Blue Smoke (Kohu Auwahi). (2:57). (Karaitiana). (Musical Import Co.). v: The Ruru Karaitiana Quintette with Pixie Williams. Day Room At Seacliff (Blue Smoke). (0:30). (Karaitiana). (Musical Import Co.). Don McGlashan. Leaving Seacliff. (2:15). (McGlashan). (Mana Music). Don McGlashan, David Guerin & Scott Terzaghi. Po Ata Rau (Now Is The Hour). (2:55). (Trad.). (Control). v: Guide Kiri’s Rotorua Whaka Maori Concert Party. Quisiera Yo Renegar (Petenara). (2:52). (Trad.). (Control). v: La Nina de Los Peines. Ay Pilato (Saeta). (0:46). (Trad.). (Control). v: La Nina de Los Peines. Janet’s Homecoming/Dad’s Boots. (1:16). (Trad. Arr: McGlashan). (Mana Music). Don McGlashan. The Twist. (2:18). (Ballard). (J. Albert & Sons). v: Herma Keil & the Keil Isles. End Credits (Duncan Gray). (2:11). (Trad. Arr: McGlashan). (Mana Music). Don McGlashan.